I don’t believe in talent when it comes to roller derby. You might find something easier than another person does to start with but how you start your roller derby journey most definitely does not determine the outcome of your derby career. My derby story isn’t particularly unique or even interesting. I started like many others – just about able to propel myself forward but stopping needed to involve an immovable object. Like a wall or the floor. When others who joined in the same fresh meat intake as me had to give up because they couldn’t devote the time they wanted to roller derby, I made 100% attendance most months and threw myself into derby, a lot of the time literally. I’ll admit I tried too hard sometimes and threw myself on the floor doing a cross over or a derby stop and it would hurt but I wanted to be better so I’d get up and carry on. I still try too hard occasionally and throw myself on the floor but at least it’s now more controlled. My point is that I kept on pushing myself because I believed (and still do) that I am not talented. Everything I have achieved, making the A team for our bouts with London Rockin Rollers, Crime City Rollers and Windsor to name a few, is down to me and those who taught and supported me. I owe May, Bunnie and Coco in particular for my progress. I can’t say I’d be where I am now without them. As I’m thanking people, I should probably thank my ever-patient husband, Jonny as he never moans that I’m off skating or wailing to him that I’m not good enough. He NSOs for us too and that’s pretty cool. I am not a positive thinker and my brand of optimism is that if you don’t expect anything good then when good stuff happens you’ll be more thrilled as you weren’t expecting it to happen. But I read a book called “Bounce: The Myth of Talent and the Power of Practice” by Matthew Syed because roller derby is a mental game as much as it is a physical game. Matthew Syed is an Olympian (table tennis), sports writer and broadcaster… and I found his book immensely comforting. I would strongly recommend you read it if happy-clappy positivity sends you twitching. In his book, Syed explores how dedicated and targeted practice delivers results. Basically, you have to do 10,000 hours of purposeful practice to get yourself in the upper echelons of your field. If I make four training sessions a week at two hours a piece for 31 months (how long I’ve been skating with the Harlots for) then I have so far completed just over 1,000 hours of skating. No wonder I’ve watched a pedicurist heave upon seeing my feet! However, I work full time and Jonny and our bunny rabbit, Stewie need me too, so I can’t give much more time to skating. When I thought about how far I’d come in those 1,000-odd hours, I realised I’m doing pretty damn well and actually, so is everyone else in our league. Michael Jordan’s Failure Nike advert – showed that you have to embrace failure to grow. “Mental toughness and heart are a lot stronger than some of the physical advantages you might have.” said the man himself. To keep coming back to our training sessions, even when you feel like you’re failing shows a mental toughness that proves you are a Hellfire Harlot and you will be awesome at roller derby. You don’t get better at anything without reaching past your comfort zone. Syed’s book also touches on Carol Dweck’s research that showed that if you praise children for their effort rather than their results, they try harder and they achieve more because those who are praised for their talent become afraid of failing and no longer being seen as “talented”, which is referred to as a fixed mindset. We might not be children but the principles must be the same. 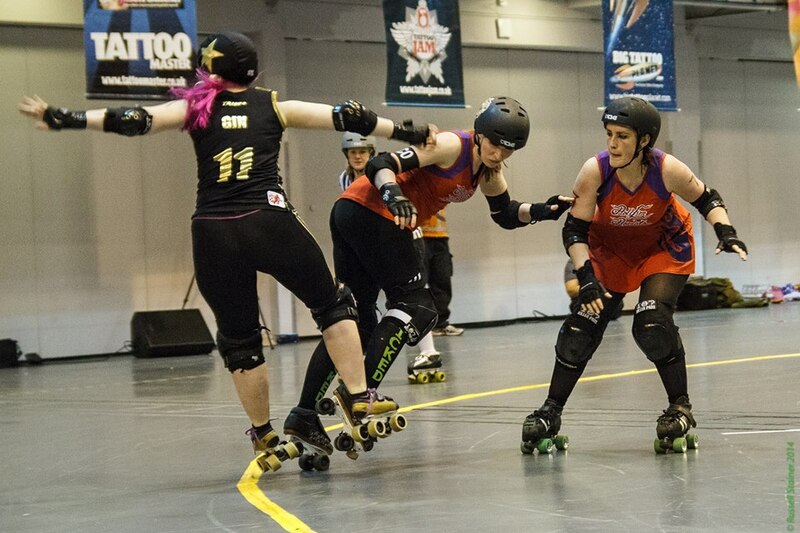 To be good at roller derby, you need a growth mindset and to see challenges as learning opportunities, not threats. I’ve got to tell you, this was all a real confidence boost to me and reinforced that to ‘keep on trucking’ was going to get me where I wanted to be. Not that I’m entirely sure what I want from derby is more than for people to fill their pants when I come up against them on the track! This is why I truly believe that it doesn’t matter where you start in roller derby. If you look around the Hellfire Harlots, you see women of all shapes, sizes and backgrounds who are united in their love for smacking each other about on the track and their determination to become their own version of awesome. Yeah, we want to win all of our bouts but everything we do, we do it together. I’m not perfect, but I am a perfect version of what I am now because I haven’t stopped trying. When I stop driving myself crazy about how I’m going to get to get better at derby, you’ll see me retiring my red uniform. Luckily I don’t see that happening any time soon. Me popping my bout cherry for the Lollypop Guild in May 2012. At 5′ 7″ tall, I must have been the wildcard! Best…. Derby article…. ever. And also, hi Treblemaker! Mate, You have constantly impressed me since I started nearly 2 years ago. You genuinely drive me. I don’t talk to you about it much as I always thought you had the self confidence to carry yourself. So for that I just want to say you are an amazing skater. You’re always pushing your own boundaries and I can’t believe I’m as lucky to be in the same sessions as you. Thank you Panic! See, I can never get over your enthusiasm and energy, it it infectious. If only scientists could bottle that and sell it, the world would be a happier place!